BRYAN EATON/Staff Photo. 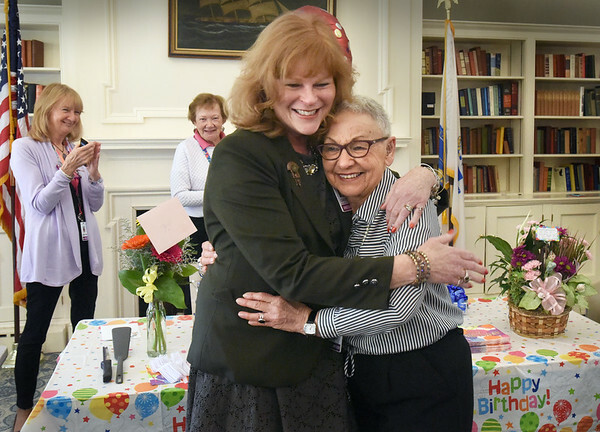 Anna Jaques Hospital Director of Volunteer Services Cheryl Satryb, gets a hug from volunteer Geri Buzzota, right, at a surprise 90th birthday attended by fellow volunteers and hospital staff including Mark Goldstein, president and CEO. Geri is a gift shop volunteer--and will continue to be--and comes twice a week and has been with the hospital for ten years, ten months, with 1,900 hours of service and she also serves on the AJH Aid Association Board.